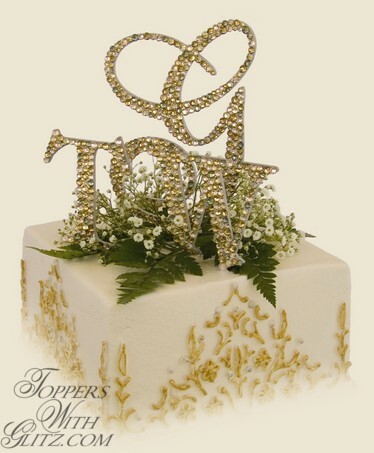 elcome to Toppers With Glitz -- home of custom designed crystal monogram cake toppers made with only SWAROVSKI ELEMENTS. Each Topper is made to exceed your expectations and is handmade by me, Sari (pronounced like "Mary" with an 'S'). I encourage you to look at some of the work I've done by visiting my Gallery page or to read what former brides have had to say about their monogram cake toppers on the Testimonials page or my Facebook page. You can also find out more about why I think my toppers are unmatched on the Why Us page. I want you to enjoy picking out your topper, so if at any time you have questions or feel overwhelmed, don't hesitate to call on me. ince each monogram topper is hand-made to order it generally takes about four weeks from order to delivery. Make sure to check our Calendar to ensure I can deliver your topper in time and avoid any unncecessary shipping charges. Limited options are available for rush situations, and those can be turned around in as little as three days in some cases. Contact me if you'd like to know for sure if I can make your date. 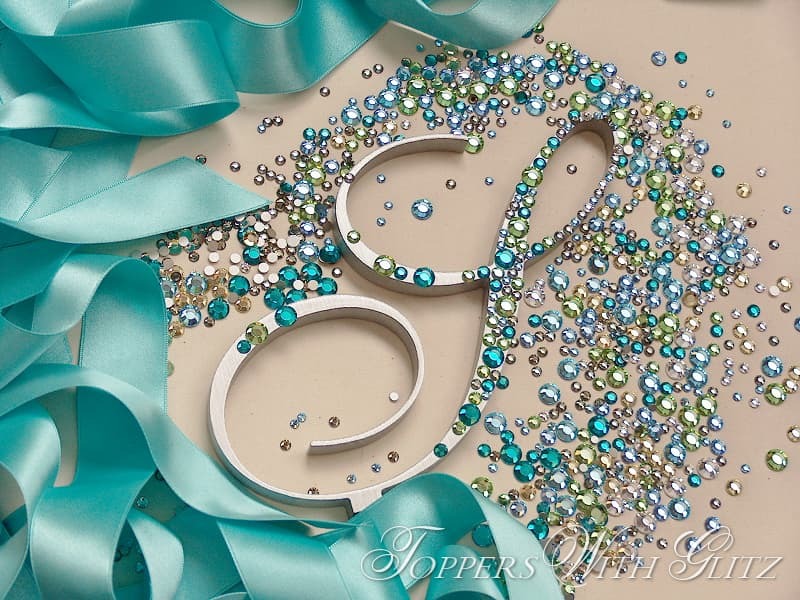 he first thing you'll want to decide is what kind of crystal topper you want: single letter cake topper, full monogram cake topper, or a custom design. If you opt for a single letter topper, you'll next want to determine what height topper you need based on the diameter of your top cake tier. Check out Cake Topper Types for more details and help choosing the proper size. If you are leaning toward a full monogram cake topper, I offer two types, traditional (xYz) and modern (X&Z), which come in standard heights. I can also often work with monograms and shapes created by your other wedding vendors like your graphic designer or invitation company. electing your cake topper fonts is the next step, and I have a large selection to choose from. You can view by letter to easily view all the available choices for the letter you need. Using the Preview feature can help with visualization and in determining how well different fonts compliment each other. If you don't see the perfect font here on the site, let me know and we can work together to find the one you're looking for. hen picking out your Crystal Colors, think about the other colors used to decorate your cake and the overall look you're trying to achieve with the cake topper. Do you want the Topper to be the focal point (dark colors) or an accent (light colors)? Do you want all of your wedding colors represented in the Topper or maybe one in particular that is lacking in other places? The pictures on the Crystal Colors page were modified to reflect their real life color as accurately as possible, but crystal colors do vary in different lighting and on different computer monitors. Upon request, I'm happy to send crystal samples so you can be sure of exactly what they look like. I've also put together a Color Tips page to give you some ideas of color combinations that might work with your scheme. very order comes with the option of full or partial crystal coverage. Pictures of each can be found in the Gallery section. If silver or gold is a color in your wedding, having partial coverage is an easy way to incorporate that color into your cake. he back of your Topper can also be covered in crystals. You may want to consider this option if your cake will be displayed in the center of a room, visible from behind. Also, if you opted to upgrade the thickness of your letters, crystals can be placed on the sides of the Topper for a fully encrusted look. 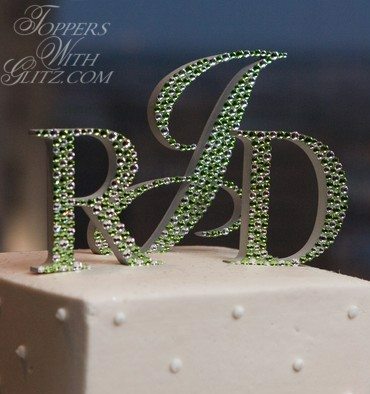 inally, you can add more coordination to your wedding with crystallized accessories matched perfectly to your monogram cake topper. I offer cake server sets and bouquet jewelry using the exact same colors, quality and attention to detail as my monogram cake toppers. 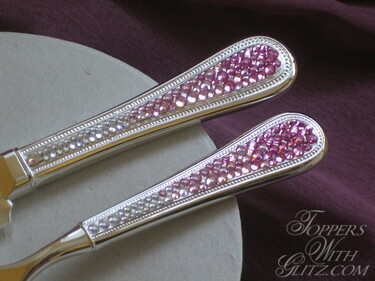 Toasting flutes and crystal cake trim are the newest additions to my product line but are pre-made and are only available in 'Crystal', or clear, stones. ll of your decision making is over now. Phew! 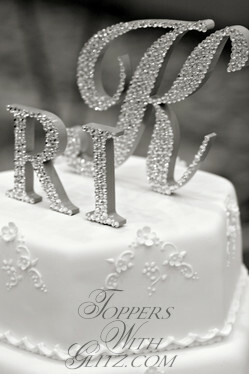 The last thing you can be thinking about is how you will want to display your monogram cake topper after the wedding. The mounts used to position your topper in the cake are removable so that you can preserve the memories of your wedding by having your cake topper on display. I don't sell any display items but have gathered some ideas on my Keepsakes page that other brides have shared with me.